An appetizer, salad, and entree for only $11.99, plus Samuel Adams® OctoberFest is only $2 all month. 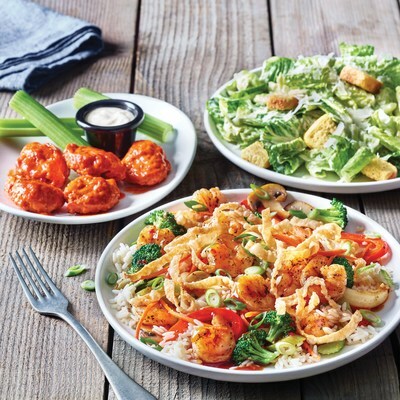 GLENDALE, Calif., Sept. 4, 2018 /PRNewswire/ -- Now for a limited time, Applebee's®Neighborhood Grill + Bar restaurants nationwide are serving up the NEW 3-Course Meal for one, including an appetizer, side salad and entrée. Starting at just $11.99, you can get the ultimate dining experience when choosing not one, not two, but THREE crave-worthy items from a selection of some of the most-loved dishes. 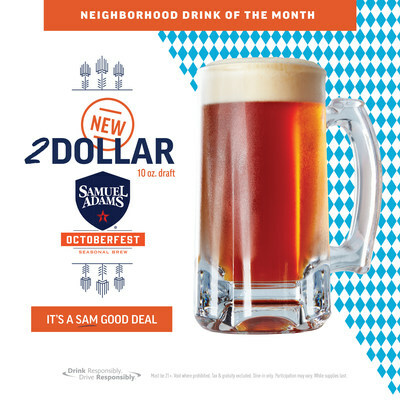 But wait, the value doesn't stop there – Applebee's new Neighborhood Drink of the Month is the 2 DOLLAR Samuel Adams OctoberFest and it is available through the month of September. "While much of our menu is designed to be shared, we know sometimes you just want it all to yourself. Which is why for our latest limited time offer, we're giving you the salad, the appetizer and the entrée – a tasty 3-Course Meal – that's all yours at a crazy price of only $11.99," said Joel Yashinsky, chief marketing officer at Applebee's. "At Applebee's we pride ourselves on great tasting food that you love and making sure it is at a price that you value." Course 1 (Side Salad): Start by selecting your side salad – House or Caesar, it's up to you! Course 2 (Appetizer): Next choose your appetizer from one of four guest favorites – pick from saucy Boneless Wings, cheesy Mozzarella Sticks, creamy Spinach & Artichoke Dip, or Crunchy Onion Rings. And of course, with Applebee's latest gift to the world comes a refreshing Neighborhood Drink of the Month – the 2 DOLLAR Samuel Adams OctoberFest which will be available at your local participating Applebee's through the end of September. Enjoy a 10-ounce draft of this limited-release seasonal beer just in time to get in the spirit for fall festivities. As always, Applebee's reminds guests ages 21 and over to please drink responsibly. "This September, our Neighborhood Drink of the Month knocks it out of the park for our beer lovers," said Patrick Kirk, vice president of beverage innovation at Applebee's. "Samuel Adams OctoberFest is one of the most anticipated beer releases of the year, and at just $2 for a 10-ounce draft, who wouldn't say cheers to that?" Not in the mood to dine in? Order and pay online, pick up your food, and head home with Applebee's To Go. Plus, for a limited time, take home a fountain drink for just 99 cents with any Applebee's To Go order. Restrictions may apply. For more information on this and other limited time offers from Applebee's, visit Applebee's online. Price and participation may vary by location. Void where prohibited. Applebee's Neighborhood Grill + Bar offers a lively casual dining experience combining simple, craveable American fare, classic drinks and local drafts. All Applebee's restaurants are owned and operated by entrepreneurs dedicated to serving their local communities, and offering quality food and drinks with genuine, neighborly service. Applebee's is one of the world's largest casual dining brands; as of June 30, 2018, there are more than 1,700 Applebee's franchise restaurants in all 50 states, Puerto Rico, Guam and 13 other countries. Applebee's is franchised by subsidiaries of Dine Brands Global Inc. [NYSE: DIN], which is one of the world's largest full-service restaurant companies.